Do you enjoy trading price action patterns? Would you like to learn some profitable double top strategies? In this addition to my free price action course, I’m going to show you a few profitable ways to trade the double top pattern including my favorite Forex double top strategy. There are many ways to trade the double top chart pattern. In this article, I’m going to show the two traditional double top strategies that I have used in the past. These are the most well known double top strategies. Although these traditional patterns are relatively profitable, I’m going to show you why I don’t trade them anymore. I’m also going to show you my favorite Forex double top strategy and why you should start trading this pattern like I do. What is a Double Top Chart Pattern? A double top is a strong bearish reversal pattern. It occurs when an uptrend fails to make a higher high and instead, makes an equal (or near equal) high. The psychology behind the pattern is that the failure to make a higher high could be an early sign that the momentum is leaving the uptrend. The equal high is an indication that the previous high is being tested and confirmed as resistance. All this means that a reversal is likely to happen. As you can see from the image above, two horizontal lines are drawn off the double top. The top line is the resistance line. The second line marks the middle valley. From here on, I’ll refer to this line as the breakout line. 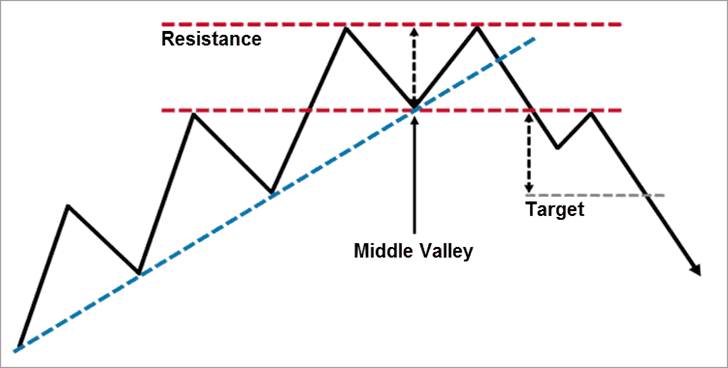 To get your profit target for this pattern, you measure from the resistance line to the breakout line. Then you take that measurement (in pips if you’re trading the Forex market) and duplicate it downward as in the image above. Note: There are varying opinions on where to set your horizontal lines, but I always set my lines off the real bodies of the candlesticks – not the highs or lows. I’m my experience this works better more often than not. Now that we’ve got the basics of the double top chart pattern down, let’s go over the two most common ways to trade it. Both of these techniques are profitable, as long as you don’t try to force a double top entry where there isn’t one. The first Forex double top strategy that we will go over is the standard double top strategy. Entry for this strategy is taken when price breaks below the breakout line. Some traders opt to wait for a candlestick to close below the breakout line and a pullback to the entry point before entering a trade. Note: As I mentioned in my article about the double bottom chart pattern, waiting for a candlestick to close past the breakout line often leads to missed opportunities. In the example below, price never pulled back to the entry point. Your stop loss is placed above the highest high in the double top pattern. As can see from the image above, the reward to risk ratio of the standard double top strategy is not great, which is why I don’t use this strategy anymore. In this example, the reward to risk ratio is less than 1:1. The next Forex double top strategy we will talk about is a little more aggressive. For this strategy, you need to draw a trendline from the most obvious lows of the uptrend to the middle valley of the double top (see the image below). Entry is typically taken after the first candlestick that opens and closes below the trendline. Note: This technique works better when there is an obvious trendline because it’s more meaningful when an obvious trendline is broken. This technique also works better with steep trends because the reward to risk ratio tends to be better. Place your stop loss above the highest high in the double top pattern. As you can see from the example above, you typically get a better reward to risk ratio using this aggressive strategy. It’s often possible to get 2:1 reward to risk ratios or better. In the example above, the reward to risk ratio was around 1.5:1. This is an improvement over the standard technique, but the next technique I’m going to show you is a huge improvement on both of the standard techniques. This next Forex double top strategy is my favorite technique because it typically provides excellent reward to risk ratios. In the example below, you could have earned nearly 5x your risk. This technique typically provides a 4:1 or better reward to risk ratio. To take the entry, you need to use another trading strategy that provides bearish entries near the tops of cycles. I prefer to use a few specific price action signals, mainly the bearish engulfing pattern and the shooting star (with confirmation and pullback). The Top Dog Trading system also works well for this. In the image above, you can see a nice bearish engulfing pattern that occurred right at the resistance line. Entry would be taken on the open of the next candlestick. The stop loss would be placed above the highest high in the double top (as shown in the image above). Note: When using this technique, it’s important that the first top in the double top pattern is followed by a nice bounce down. This helps to confirm that top as a resistance zone, which is important when you’re taking a very aggressive entry like I do with this strategy. The get your take profit, use the same technique as you would with the standard double top strategies. By getting a great entry and using the traditional take profit method, you can get some great reward to risk scenarios with this trading strategy, which means you only need to be right 1 out of every 4 trades or so to be profitable. With the traditional aggressive strategy as well as my favorite Forex double top strategy, I prefer to move my stop loss to break even before price returns to the breakout line because the breakout line could be a potential support zone which causes price to reverse and take out your stop loss. In the traditional aggressive example above, the entry was too close to the breakout line to use this technique. It’s important to give the trade room to breathe. In the example of my favorite strategy, however, there was plenty of room to move the stop loss to break even before price reached the breakout line. I like to use strong price action signals as entry triggers for this strategy. For instance, I like to wait for an engulfing pattern in which the engulfing candle closes in the bottom 1/3rd of its range. Shooting stars should be followed by a bearish confirmation candle (which also closes in its bottom 1/3rd range) and then a pullback to the close of the shooting star. Regardless of which double top strategy you choose to use, trading MACD divergence can help qualify them. When your double top coincides with lower highs on the MACD histogram or signal line, the double top will typically be a stronger pattern. I hope you like this Forex double top strategy. All of these double top strategies are profitable, but it takes some screen time to get a feel for what a good pattern looks like as it’s setting up. As always, backtest and demo trade any new strategies until you get the hang of them. Have any questions about these strategies? Let me know in the comments below. Still looking for a profitable trading system? I've tested 10+ systems. Only 3 were profitable! Learn more about my #1 recommended trading system, Day Trading Forex Live. “When your double top coincides with lower highs on the MACD histogram or signal line, the double top will typically be a stronger pattern.” I don’t understand this part. Would you please explain or have an example chart? thanks. I’m simply talking about combining MACD divergence with the double top candlestick signal. In the correct context, a double top only appears at the end of an uptrend, making it a perfect candidate for a MACD divergence play. On the second top (which should be even with the first top or close to it) the MACD makes a lower top. This shows momentum leaving the trend and is a good indicator that a reversal is about to happen. It’s not necessary to wait for MACD divergence to trade a double top pattern. The double top pattern is a strong signal on its own. However, MACD divergence in the correct context is also a strong reversal signal. So when a double top and MACD divergence coincide, the signal is typically a strong one, which is what I was saying in the sentence that you quoted. If I’m setting up for double bottom or double top, how would I know that these pattern would not change to triple top and triple bottom. If they so, then SL would be hit likely. Kindly throw some light if you understood my point. You can’t know. If that happens, you won’t necessarily get stopped out, depending on where you place your stop. If you are stopped out, take the entry on the triple top if your other conditions still allow it. Trading is risk. If you want to limit that specific risk, you could try using double top setups with MACD divergence or some other divergence. 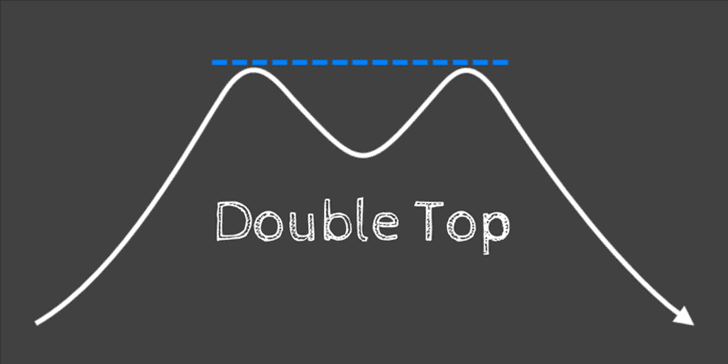 That will help you know if momentum is heading in the direction of your trade, but it will also limit the amount of double tops that you will take. If you’re comfortable with that, that may be a good strategy to consider.